USF1 is on the verge of announcing José María López as one of their new drivers. 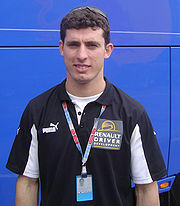 López will be the first Argentinian driver since 1998, when Esteban Tuero drove for Minardi. Tuero wasn’t highly regarded in F1. His final race was marred by a crash that influenced the outcome of the 1998 World Drivers’ Championship!.